﻿ HuntingNut » Forums » Firearms, Shooting & Reloading » Gun & Firearm Discussions » Do you shoot 3- or 5-shot groups? Do you shoot 3- or 5-shot groups? 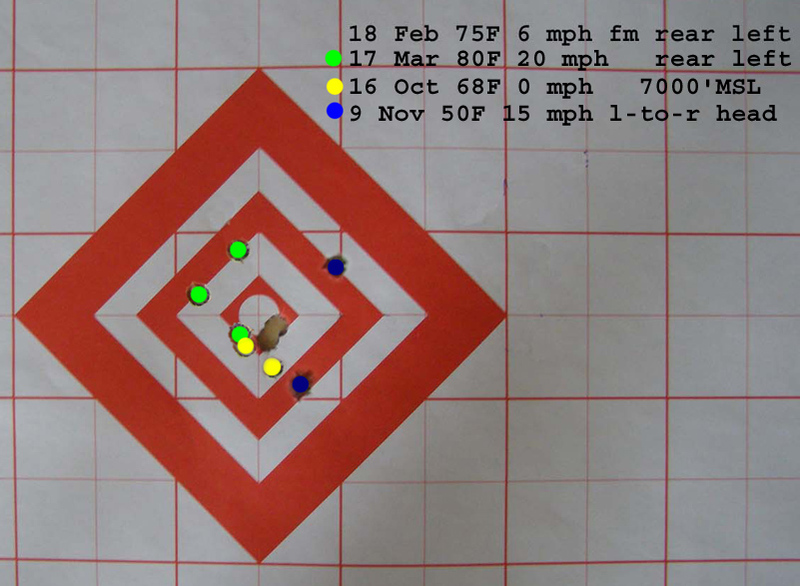 Posted: Fri Nov 11, 2011 7:49 am Post subject: Do you shoot 3- or 5-shot groups? The Dec/Jan 2012 issue of Shooting Times (pg. 64) has an article on this subject. The gist of the article is for a hunting rifle, 3-shot groups are probably all you need. For a heavy-barrel or match rifle, 5-shot (or more) groups are a better test of your rifle. I've developed a different way of shooting groups and I'm still figuring it out. I know my Tikka T3 Lite's POI start to shift after 2 shots, so even when I shoot a 3-shot or 5-shot group I let the barrel cool after 2. However, now I shoot multiple 2-shot groups. But, here's the difference. I record them over several range sessions, even for a full year. This to me is the true accuracy of my rifle's configuration. Attach is my target of record for this year shot at 100 yards. The blue shots at this last range session were the worst the rifle has done with this load, however, I found on case was a bit hard to close the bolt on and measured 0.005 beyond max case length. Posted: Fri Nov 11, 2011 8:37 am Post subject: Re: Do you shoot 3- or 5-shot groups? I will fire 3 shot groups with a rifle and 5 shot groups with a handgun. Posted: Fri Nov 11, 2011 9:09 am Post subject: Re: Do you shoot 3- or 5-shot groups? When developing a load I think the 5-10 shot groups are useful to identify variability but once you settle on a load the approach you are using would be a good way to track clean cold bore groups. On a hunting rifle that is what really counts anyway. Where is the first shot going? That is the best answer. For my competion rifles - 10 shots at 300 yards slung up in prone position is the barometer to compare groups to. Posted: Fri Nov 11, 2011 9:48 am Post subject: Re: Do you shoot 3- or 5-shot groups? The .308 I shoot cold for sighting and warm for load development. Posted: Fri Nov 11, 2011 9:49 am Post subject: Re: Do you shoot 3- or 5-shot groups? Ok, let me ask a different way. Instead of shooting your group in one range session, shoot a 3 or 5 shot group with, say, a month between each shot. I think doing it in this manner gives me a better picture of what to expect when I pull the trigger on a hunt. Basically, all my shots have been within an inch of the bull which is good. However, my MOA rifle is closer to 2 MOA if considering a time lapsed grouping. Posted: Fri Nov 11, 2011 10:17 am Post subject: Re: Do you shoot 3- or 5-shot groups? What about wind and temperature? Posted: Fri Nov 11, 2011 10:43 am Post subject: Re: Do you shoot 3- or 5-shot groups? say, a month between each shot. I can't fire one shot a month!!! Imagine the withdrawal symptoms we would have. Posted: Fri Nov 11, 2011 10:57 am Post subject: Re: Do you shoot 3- or 5-shot groups? Posted: Fri Nov 11, 2011 11:00 am Post subject: Re: Do you shoot 3- or 5-shot groups? I normally shoot 5... and always curse that 5th shot. Maybe its time to compromise and stick with 4 shot groups. Posted: Fri Nov 11, 2011 11:03 am Post subject: Re: Do you shoot 3- or 5-shot groups? I gave up using 5-shot groups for load development because its a waste of bullets and powder. It only takes me two shots know a load isn't worth persuing. That's one of the nice aspects of OCW and 3-shot groups. I start using 5- to 10-shot groups when i want to confirm the load I developed is really a good one. Same happens to me - no way I can alternate and not make a mistake. Posted: Fri Nov 11, 2011 11:07 am Post subject: Re: Do you shoot 3- or 5-shot groups? I shoot at 100 yards to minimize wind affect but as you can see it is still present. I think it good to see the affects of temperature. When I hunt, it could be 20 degrees in the morning and 65 that afternoon. Altitude is another. When I was hunting elk, I could have been at 6000' or 9000'. I want to know these affects and I'm still learning. That is why I shoot this time-lapsed grouping. I think it gives a true representation of my rifle's accuracy. Posted: Fri Nov 11, 2011 11:10 am Post subject: Re: Do you shoot 3- or 5-shot groups? When comparing charge weights or components (bullets, powders, OAL, etc) I always shoot "round robin" with the barrel allowed to cool completely between shots. 5 rounds each. The only thing that is a PITA about shooting this way is keeping chrono results tabulated correctly. Most of the time, I don't bother with the chrono until I have chosen a go-to loading that will be used at various distances. If tuning a rifle for timed-fire or rapid fire competition, I would go about this differently. Almost all of my serious shooting is one-shot hunting. The rest is just recreational practice. Then there will be other targets from different rifles with groups of at least 20 rounds. These are the rounds I shoot while getting bored during cooling the above barrel. Handguns (and rifles with iron sights) generally 10-shot groups. Sighting-in, 3 shot groups until it is "dialed in" followed by a 5 shot group (or several 10 shot groups, if I have plenty of ammo). I think the magazine articles are correct that 3 shots will be enough, provided that you take very serious care that each shot is held "perfectly" - BUT Shooting is just too much fun to limit the number of rounds that much. Of course, I am shooting at my own private area - not a shared public range. Sporter barrel- 3 max. as most barrels are just too thin for sustained firing for effect/groups. I'll track the first shot cold fouled, first shot and 3rd shot warm. Heavy barrel- ditto and 5 max. Usually 3 will tell me what I need to know. If I'm firing to test a load(s) I'll try one cold/clean for POI, 3 from cold fouled and 3 from warm if it looks promising to get an average and a feel for where the load is going and after settling on one then I'll fire for effect on the intended target/at intended range. POI will change due to many factors even with the same powder from a different lot so I make minor clicker adjustments as nec, or if things are really off, tweak the load as nec. to tighten her back up. It all boils down to barrel resonance- steel vibrates at diff frequencies under diff conditions. Posted: Fri Nov 11, 2011 11:16 am Post subject: Re: Do you shoot 3- or 5-shot groups? five shot groups for load development-then strictly one shot cold bore shots.If I have a POI question then back to 5 shot group.I have also found that with getting older my eyes change from time to time-which changes POI when I am using scoped guns,don't shoot much irons anymore. Posted: Fri Nov 11, 2011 11:26 am Post subject: Re: Do you shoot 3- or 5-shot groups? 3 shot groups for sighting in and 5-10 shots when developing and chrony the loads.